Could 'Worms from Hell' Mean There's Life in Space? It's just as well that Tullis Onstott doesn't suffer from claustrophobia. During the academic year, the Princeton geoscientist works in an office in the sub-basement of the university's Guyot Hall  a floor some of his colleagues didn't even know existed. Now that school's out, he's headed even deeper. Back in 1998, Onstott made the astonishing discovery that bacteria can thrive in pockets of hot water miles underground  far below the depth at which living organisms were known to exist before. Ever since then, he's been spending his summers thousands of feet beneath the earth, in the bowels of South Africa's deepest gold mines, prospecting for other kinds of life in this lightless, hidden biosphere. So far, the search has yielded only more bacteria  scientifically important in their own right, but still just the simplest of life forms. But in the latest issue of Nature, Onstott and several colleagues announced the discovery of a creature one step up on the food chain. They're tiny nematodes, or roundworms, and while they're plentiful in soils far overhead, this is the first time anything so complex has been discovered so far underground. That's not only a biological milestone, but perhaps a cosmic one as well. "The discovery of multicellular life in the deep subsurface of the Earth," write the authors, "... has important implications for the search for subsurface life on other planets in our Solar System." The connection to life on other planets has always been a major motivation for Onstott and others who search for so-called "extremophiles,"  organisms that thrive in the harshest environments. Traditionally, scientists who think about life on other worlds have confined their imaginations to places that resemble the biology-friendly surface of the earth. Unfortunately, planet Earth is the only place we know of so far where those conditions exist. Mars, for example may have been hospitable in the dim past, but its surface now is frigid and dry. Jupiter's moon Europa has an ocean, but it's encased in solid ice thousands of feet thick. Saturn's moon Enceladus has water as well, but it too is buried deep beneath the surface. But if life can thrive so far underground on Earth, it could plausibly do the same elsewhere in the solar system  or even on one of the burgeoning list of planets being discovered around other stars by the Kepler space probe. That possibility was intriguing enough when the life in question was bacterial. But the fact that multicellular animals can live as much as 2 miles (3.2 km) deep just ups the ante. Onstott's first clue that there might be something living off his deep bacteria came a few years ago, when he spotted what looked like tiny filaments in the bacterial films dripping from boreholes he'd drilled into the walls of the gold mines. "At first," he says, "I thought they might be fly larvae." 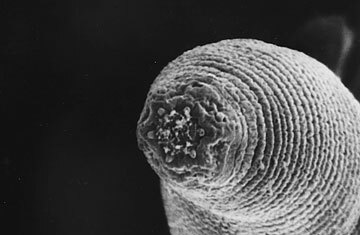 But nematode expert Gaetan Borgonie of Ghent University, in Belgium, had already found similar worms in other extreme environments, and when Onstott took him in to take a look, it was clear that they were roundworms. The scientists gave the species the diabolical name of Halicephalobus mephisto, which very loosely  and very fittingly  translates as "worms from hell." But the case wasn't closed yet: since the area in which the worms were found had been exposed to the ambient air of the tunnels, it's possible the Halicephalobus had been inadvertently taken down by miners. Once there, they could have begun colonizing  and feasting on  the native bacteria. To prove the critters were truly worms from hell (rather than worms just visiting hell), Onstott and Borgonie had to tap into veins of water that had never been exposed to air. Sure enough, they found worms there as well. The water itself was between 3,000 and 12,000 years old  rainwater that had percolated down through cracks in the overlying rock over tens of centuries. That means this underground ecosystem isn't entirely isolated from the surface, unlike some of the more pristine bacterial colonies Onstott has found. But even if the worms migrated down from above, they are clearly surviving nicely in so inhospitable a home. None of this proves that life is bubbling along happily under the sands or ice shells of other heavenly bodies inside our outside the solar system. But if the subsurface of the earth had proven to be sterile, that would have made the prospects a lot dimmer. If (relatively) complex life can thrive miles below our feet, it's at least plausible that it lives in similar conditions elsewhere in the cosmos  particularly within Mars, where organisms might have retreated when the environment above grew deadly, just as the Halicephalobus percolated down below after first living on the surface. And that means the search for alien life is a lot more wide open than anyone would have imagined just a few years ago.